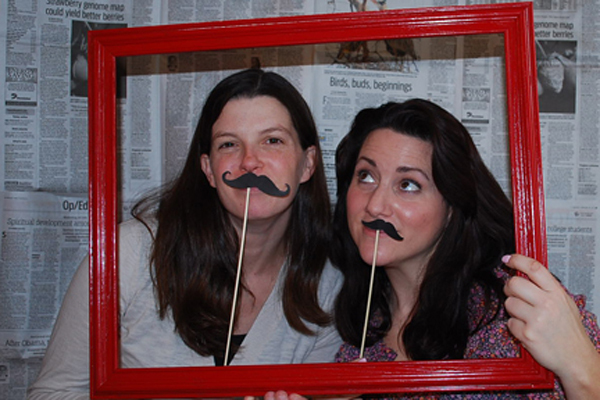 I “met” my friend Ashley through this wild blogosphere and I can just tell that she is such a funster! To prove it, let’s talk about the adorable farewell party she threw for a friend of hers. I cannot get over the clever ideas she came up with. She invited 14 ladies over for a farewell potluck brunch for her friend that was moving to Virginia. 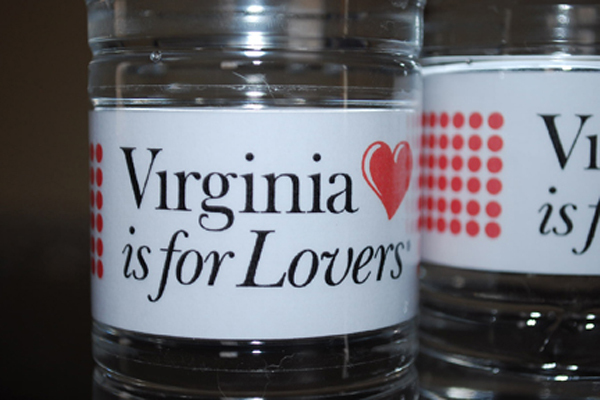 Clever Ashley went with the “Virginia is for Lovers” theme since she “loves the states slogan and of course love red and white.” She had everyone bring a recipe for the guest of honor and they filled out Cleveland postcards (which is where they live! Duh!) to wish her and her family well in their next adventure. Aren’t those all such great ideas? But wait! My FAVORITE idea for a farewell party is what she did next. About a week or so before the party she called the Richmond Times, the VA travelers center and a few relocation offices and was mailed tons of great maps, information, cds, newspapers and moving information. With these items, she decorated her house – and beautifully so! 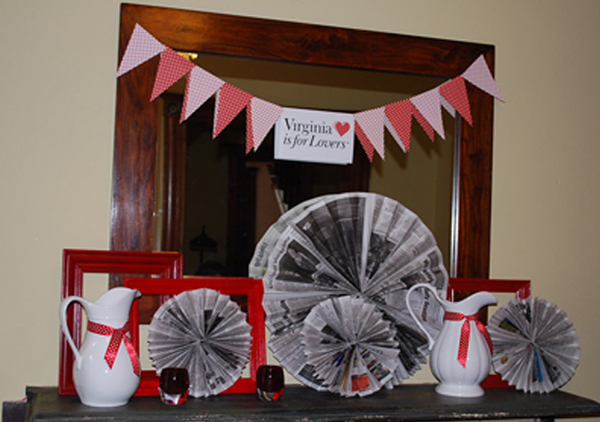 I ADORE how she turned the Virginia newspapers into those fun pinwheels and as a backdrop for the photobooth. I just think everything about these ideas are just so fun and so clever. I know I wouldn’t have come up with calling the new town’s relocation offices but what an absolutely brilliant idea! I would say I want to host a farewell party too, but I don’t want any of my friends to move. But man… if I could throw a party like this, it might just take the sting out of it, right? Great job Ashley and thanks for letting me share it with these party peeps! This entry was posted in not my party, parties for grown ups and tagged bon voyage party, farewell party, moving party, red white and newspaper party, virginia is for lovers, virginia party, we'll miss you party by Annika. Bookmark the permalink.